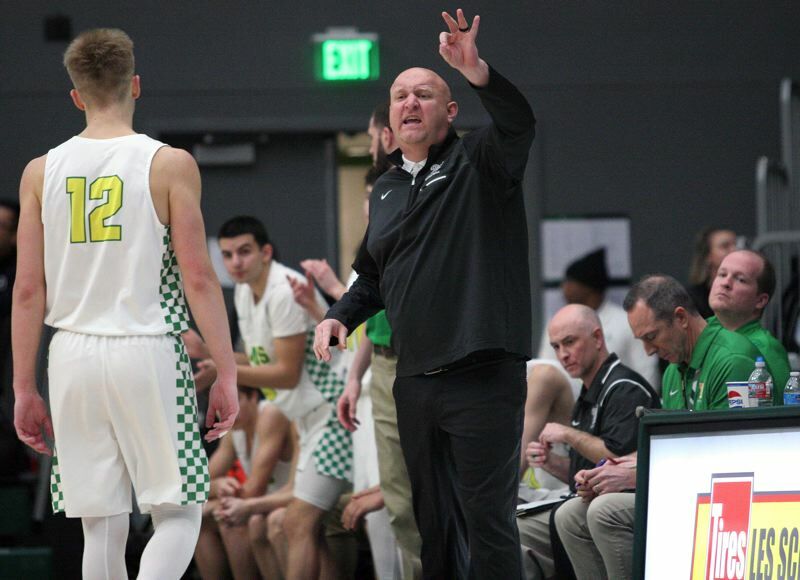 West Linn boys basketball coach Tyler Toney announced his resignation following the Lions' Friday night loss at South Salem in the second round of the Class 6A state playoffs. Toney, 38, led the Lions for three seasons after being hired to replace Eric Viuhkola, who ended his eight-year tenure at West Linn with four straight Class 6A state championships. During Toney's three years, the Lions went 31-9 in the Three Rivers League and 52-28 overall, winning the TRL title and finishing third at state in 2017, taking second in the TRL in 2018 and losing in the second round of the playoffs, then falling to fifth in the TRL in a 2019 season ravaged by injuries and player defections. Toney said on Monday that his decision to step down had nothing to do with his team's Friday loss or the difficult nature of the 2018-19 season. Toney, a West Linn resident who has four children (ages 9, 7, 5 and 3) with his wife Michelle, said he needed to dedicate more time to his family and less to coaching. "It's a lot of time. By no means am I complaining about it — it's what I signed up for — but being a father figure to some of these kids that I've coached for the last 15 years, I'm excited to do some of that stuff with my own kids as they grow up, to see them grow into young men and young women," he said. As to the turbulent nature of the just-completed 2018-19 season, here's a look back at some of the challenges the Lions faced this season. • Senior point guard Drayton Caoile, a third-year starter, left the team in early January after complaining that he had been bullied by a team parent. • Junior guard Micah Garrett, the team's leading scorer, missed most of the second half of the TRL season with an injury, and after two games back in the lineup, was injured again in the Lions' playoff opener against Forest Grove. • Junior guard Bryson Crockett, the team's second-leading scorer, was injured at the end of January and missed the second half of the TRL season and both the Lions' playoff games. • Junior wing Parker Durbin, another member of the Lions' regular rotation, also missed time with an injury midway through the TRL schedule. • Junior wing Damiko Tidmore left the team before Friday's game against South Salem. • Junior guard Andre Best transferred to Oregon City following the end of the 2017-18 school year. "I've never seen anything like this at West Linn for sure," said Toney, himself a West Linn graduate who played his high school ball under former coach Bart Valentine. "The stuff that our kids went through this year, I've never even heard of another team going through as much stuff as we went through." Despite all that, Toney said that he made his decision to step down back at the beginning of January. "That game on Friday night had nothing to do with my decision," Toney said. "I know I've missed one of my daughter's birthday parties and a big AAU tournament for my son — I've probably missed 90 percent of his AAU games (this year). "I wanted to make sure that I was there for their needs, and as much as I love all the (West Linn players) and want them to have success in the program, my first responsibility is to my family and to my kids so that's when I decided." Toney, who previously served as an assistant under Viuhkola for five seasons, led the Lions through a challenging transition period that began with a hailstorm of criticism when the West Linn program was bolstered by a number of high-profile transfers in the 2016-17 season. The Lions started fresh again for 2017-18 after graduating all five senior starters from the year before, competed well, but failed to reach the state tournament for the first time since 2010. And then came the whirlwind of change and challenge in 2018-19, a year that ended too soon for the Lions' preferences, but also included some real positives, according to Toney. "For the kids to play hard and stay together and really play their best basketball towards the end of the season, the second half of the season, I couldn't be happier as a coach," Toney said. "It was something they took great pride in, that our program has great pride in. … We weren't going to let one or two things, or this year, three or four things, affect what we were trying to do which was to play hard and play for each other." So now, Toney will step back, focus on his marriage and family, and enjoy some time out of the coaching spotlight. "I might coach again at some point, but I need a little bit of time to just hang out with them right now," he said. "But It means a lot to me that the next coach does a great job. I'll still be very involved with youth program so I'm excited for the future of West Linn basketball. "There's a lot of talent here. There's a lot more talent coming up through the youth program as well. Boys basketball at West Linn is in good hands talent-wise and I'm confident they're going to hire someone who's going to do a great job in that position."